If you live in Norfolk, when anyone mentions pork pies you know they’re likely to be talking about those made by Bray’s Cottage. 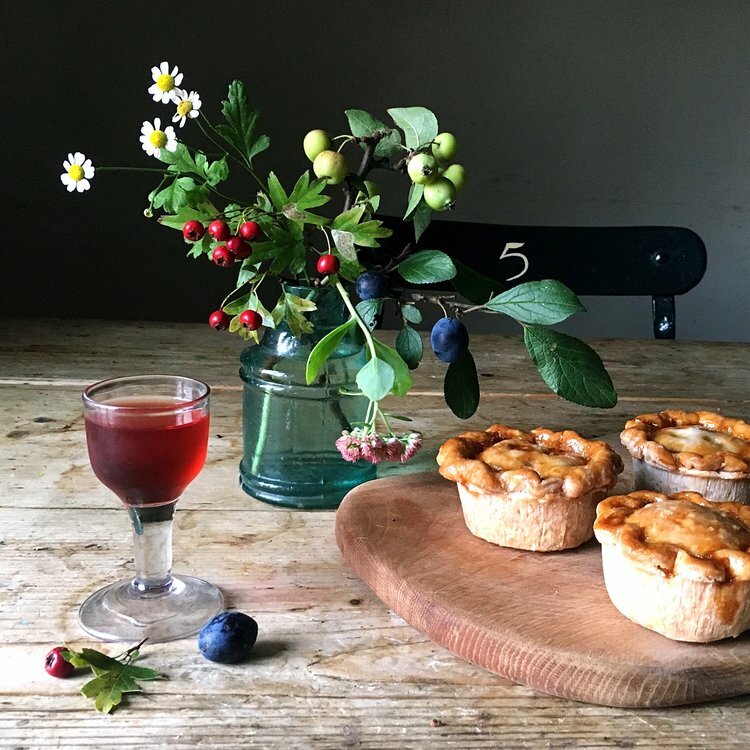 In 2017, Bray’s celebrates 10 years of trading and so it was an ideal time for me to meet the founder and owner Sarah Pettegree and chat to her about the porky deliciousness of her pies and sausage rolls and also find out a little more about the woman behind the brand. After a degree at the University of East Anglia, Sarah found employment as a civil servant at the Ministry of Agriculture, working as a humble clerical assistant because “I needed a job”. The job didn’t pay particularly well and there were no career prospects but luckily Sarah later passed a Civil Service promotion board and was offered a role at HMSO (Her Majesty’s Stationery Office) which surprised her seeing as she wasn’t very good at maths: a management accounting job! There was no other offer on the horizon and so Sarah bit the bullet, learned to do the job well and eventually became a qualified Chartered Accountant. When HMSO was privatised in 1996, Sarah was made redundant and worked in various contract positions for organisations such as Norwich Union and CITB. Thanks to experience gained in her previous job, she was able to train managers on various in-house business management systems. While this meant she was moving away from accountancy, it was also giving her an opportunity to learn how people ran their businesses. At the same time, the television programme “Dragons’ Den” was in its early days and Sarah was interested to watch the start-up process surrounding new business and whether they succeeded or failed. Sarah had always felt the pull of the countryside and once she realised she no longer wanted to work in Norwich or London, she moved to the Norfolk countryside in 2001 and took time to think about what sort of business would be sustainable. One of her early ideas was to do something using her arty skills – Sarah had studied painting and sculpture at the Open College of Arts – but realised although it would be enjoyable, she would be unlikely to earn a living from it. Then she thought of something food-related. A friend had a couple of saddleback pigs and the idea of making pork pies was born. Sarah felt that the traditional pork pies that were generally available in supermarkets or even butchers’ shops were all quite “samey”, with no unusual or interesting flavour combinations available. 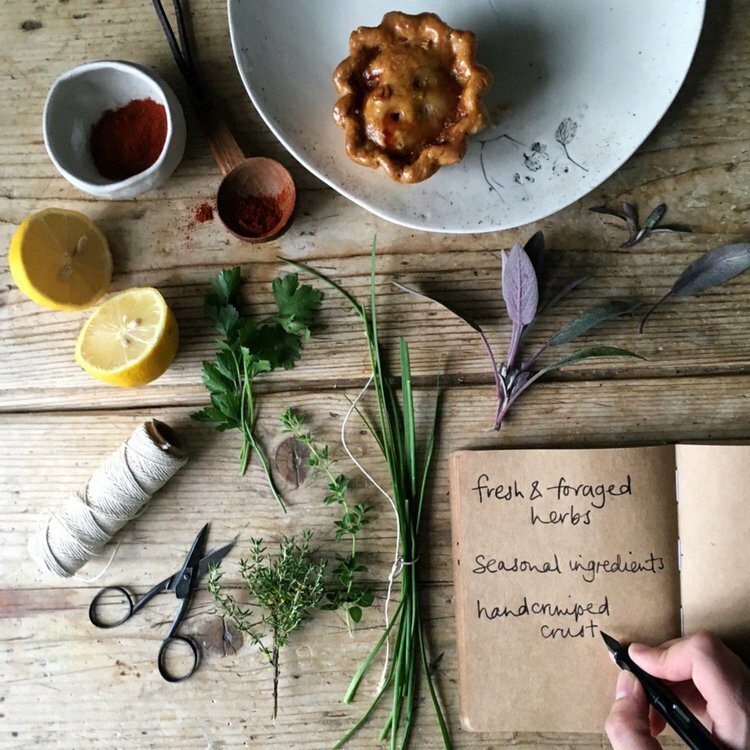 Sarah’s pies took off and her initial sales – via a website with a mail order facility -resulted in an article being written by the Food Editor of The Sunday Times. Sarah’s first big customer was “The Green Grocer” in Norwich and in 2006, they told Sarah that her pies were their best-selling product (after potatoes). They are still a valued customer today. 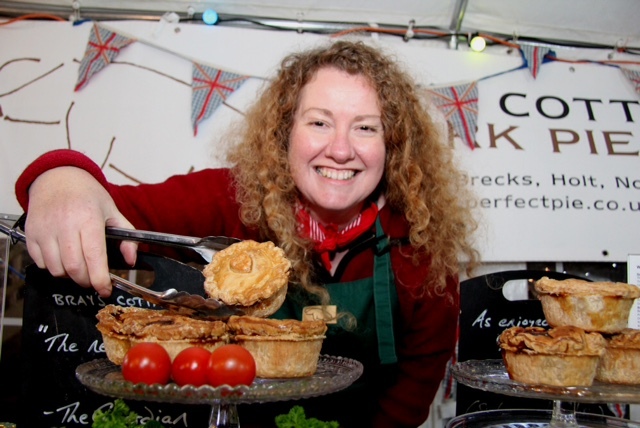 Here’s Sarah at one of the many Norfolk foodie events she attends – doing what she does best! These days, you can buy Bray’s Cottage “Pies by Post” via the website otherwise you’ll find them only at independent retailers and pubs. During any given week, Brays could be making between 1,000 and 3,000 pork pies and there are seasonal spikes at times like Christmas and Valentine’s Day. You can even buy a pork pie “wedding cake”. A small range of sausage rolls was added to the Brays repertoire when one of Sarah’s retailers mentioned that the ones available elsewhere weren’t particularly good. There are now two sizes of Brays sausage rolls and two flavours: plain and with onion marmalade. Interestingly, the onion marmalade pork pie is Sarah’s best seller. Having tasted it, I can see why! Apart from Sarah and her partner Derek (who gave up his music career a few years ago to help with the business), there are 8 members of staff at Brays who are the “bakers and makers” of the pies and sausage rolls. Derek mostly deals with administration, book-keeping and the local deliveries although Sarah pointed out that he can also bake! Sarah now focuses on growing the business, marketing, PR and maintaining a lively presence on social media. I asked her if there had been any low points in her pork pie career and she said the early days of setting up a small business are very challenging. You have to work really hard and it takes over your life. Now, 10 years on, Sarah said it’s more manageable now there are people to whom she can delegate and she has time to appreciate the rewards: working in a great environment, supplying a product that people love and also having fun along the way. I asked what the future holds for the Bray’s Cottage brand and Sarah said “more of the same”. She wants to grow the mail order side of the business and link up with more Norfolk and UK wide retailers. At the moment, some of the places in Norfolk where you can buy Brays pork pies are Picnic Fayre in Cley, Back to the Garden in Letheringsett, Walsingham Farm Shop, Henry’s Coffee Store in Cromer and Blakeney Deli. There are other stockists of Bray’s further afield too e.g. London, the Midlands, Wales and the North of England. A full list of stockists is on the website. You can find Sarah at Creake Abbey Farmers’ Market on the first Saturday of every month (during the season) and at bigger local Norfolk events including the Aylsham Show and the North Norfolk Food Festival. And if you want to learn how to make outstanding pork pies yourself, Sarah runs classes in Norwich. Details are on the website but spaces sell out fast. Sarah said her life now is so different from when she used to be an accountant and she thrives on the positive comments she receives about Brays’ products. “After all”, she said, “nobody ever told me I’d produced the best spreadsheet they’d ever seen”! This article originally appeared on the Norfolk Places website. Back in the blogging saddle! A (Gypsy) Tart with a Heart! 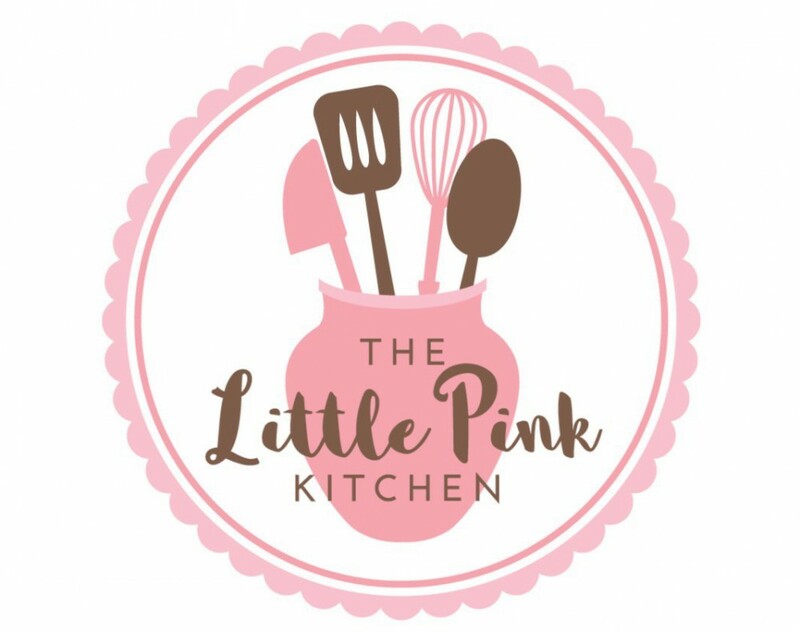 TheLittlePinkKitchen on Never Say Diet!